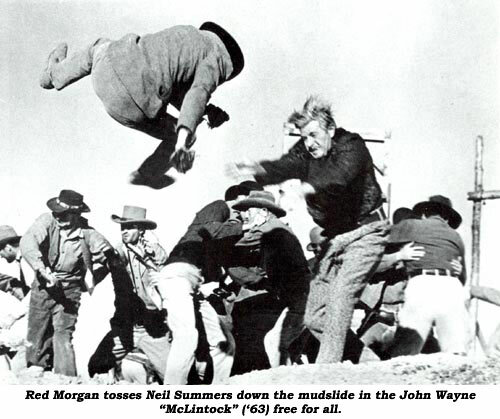 Boyd “Red” Morgan was literally born in the saddle October 24, 1915, at Waurika, OK, and lived his first 12 years on a combination farm/cattle ranch. Red (so nicknamed for his bright red hair) stated he was hard pressed to remember when he didn’t ride. His first taste of show business came living for 15 months with an uncle who was a rancher and rodeo performer. Red started high school in Hobbs, NM, but finished after moving to Holtville, CA. He was outstanding in athletics and received a football scholarship from U.S.C. in 1935. Arriving at the university in July for football practice, Red was recruited for his first professional job…playing halfback in a football picture. He joined the Screen Actor’s Guild in ‘36 but after graduating from U.S.C. was recruited by the Washington Redskins. He joined the Pacific Coast League in 1940 and played a little with the Hollywood Bears and later with the Birmingham Generals. WWII was going full bore in ‘42 when Red joined the Navy as an Ensign. Graduating from U.S. Naval Academy, he was sent to St. Mary’s Pre-flight Training Center for 16 months. Upon leaving the service he coached football at Polytechnic High School in Long Beach until 1948 when he gave up the back field for the back lot. One of the greatest stunt careers ever was about to begin. 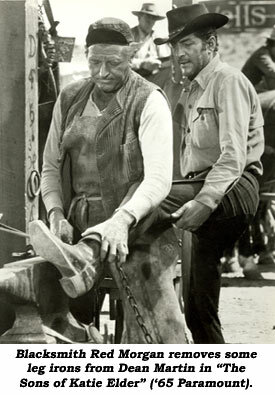 Big, burly Red found himself in high demand due to his prowess with horses and soon became one of Hollywood’s top stuntmen, constantly employed doubling for Dean Martin, Scott Brady, Gene Evans, Anthony Caruso, Stuart Whitman, Darren McGavin, Robert Preston, Peter Graves, Jim Davis, Leo Gordon and countless others. The legends with whom he worked and the hundreds of films and countless TV episodes to which he added excitement read like a listing of every top film done in the last 40 plus years. “The Alamo”, “War Wagon”, “Sons of Katie Elder”, “Arizona Raiders”, “Rio Lobo”, “Five Card Stud”, “A Distant Trumpet”, “Ten Wanted Men”, “North To Alaska”, “The Stalking Moon”, “McLintock”, “Last Musketeer”, “Desert of Lost Men”, “Snake River Desperadoes”, “Winning of the West”, “Riding Shotgun”, “How the West Was Won”, “True Grit”, “Roy Rogers”, “Gunsmoke”, “Tales of Wells Fargo”, “Cimarron Strip”, “Gene Autry”, “Range Rider”, “Lawman” and hundreds more just as impressive. Red passed away in 1991 leaving behind wife Lucille and two children, Riley and Laurie. I knew and admired Red Morgan all my professional life. A hard taskmaster but a willing one, he taught me a lot. When it came time for me to become a member of the Stuntman’s Association, Red was one of my main sponsors. A lot of people pass through one’s life, some you hardly remember, but Red Morgan will never be forgotten by me. A special, giving man who gave me a good leg up in a business I love and a friendship I’ll always treasure.